Bolivia Visa Requirements - Student Visas - FAQ Frequently Asked Questions. 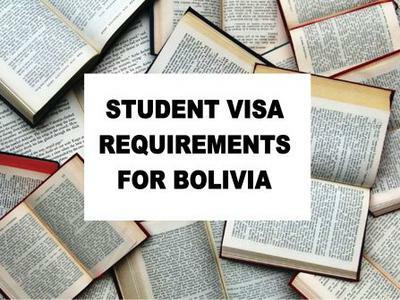 Requirements to Obtain a Bolivia Student Visa. This information on the requirements for obtaining a Bolivia student visa is from the official website of the Bolivia Immigration Service. Please note that there is another visa called the "Exchange Student Visa" and you should inform yourself on both in order to know which is the best option for you. This Bolivia Student Visa is an entry visa only. It enables you to travel to, and enter, Bolivia. Once you arrive, you will have 60 calendar days to complete the application process for residency in Bolivia for the period of time you plan to live and study in Bolivia. 2. Pasaporte con vigencia mínima de 6 meses. 3. Certificado de vacuna contra la fiebre amarilla si visitará zonas endémicas de alto riesgo. - Título de bachiller, licenciatura o post grado. - Libreta o registro de notas. 5. Certificado vigente que acredite que la persona extranjera no tiene antecedentes penales y/o policiales, expedidos por autoridad competente en el país de origen o de su última residencia, (no aplica a menores de 16 años de edad). A current certificate that accredits that the foreigner has no prior criminal and/or police record, issued by the competent authorities in his or her country of origin or last residency (does not apply to minors under the age of 16). 6. Fotografía actual (4x4 fondo rojo). Good information thanks for sharing nice post. Hi, My girlfriend wants to live in La Paz, Bolivia for a year, she is from Thailand, and she wants to learn spanish. Can she get a Student Visa as Spanish language Student?? Is there any language institute in La Paz , where she can enroll and where they can guide me how to get this Visa??. What advise can you give me?? She would be willing to do some kind of volunter work too, she does speak some english. How do I apply for a student visa for Bolivia? What forms are required to apply for a student visa? How do I get a student visa for Bolivia? Comments for How do I get a student visa for Bolivia? You may check the site www.rree.gob.bo for the details of student visa requirements or Bolivian Embassy in USA. 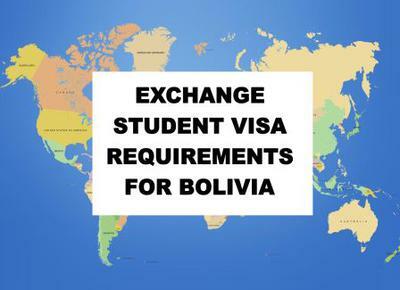 Requirements to Obtain a Bolivia Exchange Student Visa. This information on the requirements for obtaining a Bolivia exchange student visa is from the official website of the Bolivia Immigration Service. Please note that there is another visa called simply the "Student Visa" and you should inform yourself on both in order to know which is the best option for you. This Bolivia Exchange Student Visa is an entry visa only. It enables you to travel to, and enter, Bolivia. Once you arrive, you will have to visit the nearest Bolivian Immigration Services office to complete an application process for temporary student resident status in Bolivia. Con Convenio Estatal: Es otorgada por ciento ochenta (180) días calendario, con la finalidad de cursar estudios en virtud de acuerdos académicos estatales, tiene carácter gratuito y habilita a tramitar la permanencia temporal de estudiante ante la Dirección General de Migración, por un periodo similar. Con Convenio Privado: Es otorgada hasta por ciento ochenta (180) días calendario, con la finalidad de cursar estudios en virtud de acuerdos académicos entre Universidades públicas o privadas u otros centros de enseñanza con similares del exterior y habilita a tramitar la permanencia temporal de estudiante por un period similar ante la Dirección General de Migración. Under an agreement with a State institution: Issued for one hundred and eighty (180) calendar days, when your purpose is to study under an academic agreement between state-run schools and universities. The visa is free and enables you to apply for temporary residency as a student at the Bolivian Immigration Service, for a similar period. Under an agreement with a private institution: Issued for one hundred and eighty (180) calendar days, when your purpose is to study under an academic agreement between private schools and universities or other similar educational institutions in a foreign country, and enables you to apply for temporary residency as a student for a similar period at the Bolivian Immigration Service. 1. Formulario de Declaración Jurada de Solicitud de Visa, obtenido de los sitios web de la DIGEMIG, de la Dirección General de Asuntos Consulares o en Representaciones Consulares donde se solicite la visa. 4. Si aplica a visa de estudiante con Acuerdo o Convenio Estatal o Privado: carta de aceptación original o fotocopia legalizada emitida por la Institución de Educación Superior de destino. If you apply for a student visa as a student whose a greement is with a state or private institution: present the original letter of acceptance, or a legalized photocopy issued by the Higher Education Institution in the destination. If you apply for a student visa as a student with a private institution: you must also present a legalized copy of the corresponding interinstitutional agreement, which stipulates the type of student exchange that will take place. US Student Applying for Bolivian Student Visa? Hi! I am applying for a student visa and I am struggling to get a legalized criminal record - Arizona is a closed record state and can only give me one for the county that I live in and not the entire state. Does this mean that I need to go through the FBI to obtain a national background check? Also how much is solvency? And if I am a student can my parents be proof of solvency for me? I'm a U.S. citizen studying for a semester in la Paz at la UMSA (not through a program) and am looking for the easiest and cheapest way to extend the 30 day temporary student visa I was issued at the Bolivian consulate in NY. So far, I've been able to get a letter from inmigraciones that says all student visas automatically last for 60 days, which should mean my temporary student visa is valid until the end of March. However, I won't be leaving until the end of June, which means I won't have a visa for three months. I've talked with people who've extended their visas here legally on their own, and heard some horror stories of spending literally months working through the bureaucracy, and having to pay bribes anyway. 1. Pay the a fine when I leave the country, which would come out to 300 total. Aside from the money, I'm worried about the repercussions for overstaying a visa for 3 months. 2. Leave to go to Peru at the end of March and reenter with a 90 day tourist visa, which would last just until the end of my stay. This seems like the best option. Do you have any advice about dealing with customs officials? 3. Hire a lawyer. I've heard they can be up to 300 dollars just for their own fee though, which would be the price I'd have to pay for overstaying my visa anyway. Could you recommend a good one? In your case i sugest you to have a tourist visa in Peru border (if you can afford traveling to Peru) get a tourist visa or at least a Specific porpose Visa, this SPV lasts 30 month but you can ask for two extentions 30 days each extention; but this way takes more time, try to get a tourist visa and if you stay longer than 89 days you pay the fine. Paying fine can be in your record but it doesn´t determine in next visa applications. The other way is to have a one year residence Visa, it is more expenssive and you need to follow some requirements. Those are the only options to stay longer in Bolivia. I hope i´ve helped you. What are the student visa requirements for an American?